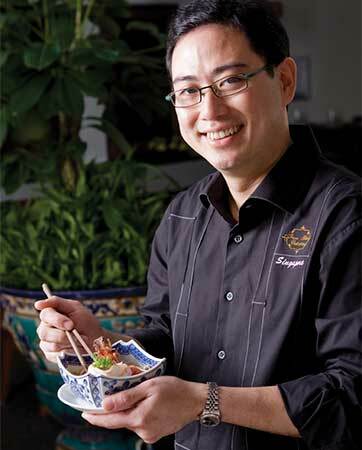 Benjamin Seck (or Baba Ben as he is affectionally known) is the Chef of True Blue Cuisine, an award-winning Peranakan Restaurant which was rated one of the Top Restaurants in 2006 and Best New Restaurant in 2005 by Wine & Dine. True Blue Cuisine has been on their list of top restaurants in Singapore since then. Baba Ben started True Blue Cuisine with the assistance of his mother, the famous Peranakan chef, Nyonya Daisy Seah, who has been instrumental in passing on her culinary skills to him. Baba Ben loves to experiment with fusion Peranakan dishes. He is one of the first chefs to use edible orchids to enhance the flavour and appearance of his dishes. By no means new to the cooking scene, Baba Ben was the food preparer and stylist of the Arts Central cooking programme ‘Ways of the Matriach’ – Series II and III in 2003 & 2004. Baba Ben added another feather to his cap in 2003 when he was one of the top three finalists for Chef Wan’s ‘Masak Apa’ cooking competition programme on the Suria Channel. A well-known personality among the Peranakans, Baba Ben has truly immersed himself in the culture since his teenage years. Not only does he run True Blue Cuisine, he is also the Managing Director of Saint Francis Enterprise Pte Ltd which is famous for producing fine hand-embroidered traditional kebayas and bead-work for slippers and bags for more than a decade. Rediscover our Peranakan heritage. Do not miss this opportunity to chat with the amiable Baba Ben and find out more about our culture and traditions, in addition to watching his cooking skills. Daisy is Benjamin’s mother. 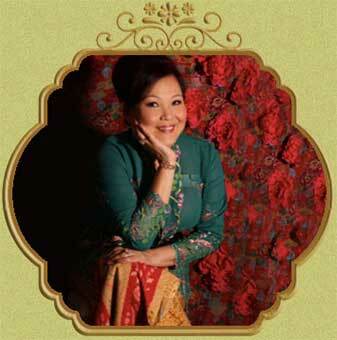 She is a famous Peranakan cook who has been cooking for a number of Peranakan Restaurants for members of her family. When Benjamin started True Blue Cuisine in November 2003, Daisy was instrumental in assisting him. Together they came up with the most authentic Peranakan menu. Daisy cooked up a storm with her signature dishes such as Ayam Buah Keluak, Ngoh Hiang and Chap Chye. As the Restaurant does not serve pork or lard Daisy used her skill by using chicken to substitute for pork without any major changes in the taste of authentic Peranakan dishes. Daisy also produces vegetarian dishes close to the taste of the ala carte dishes. Daisy is now a Consultant with True Blue Cuisine as she is slowly handing over her reign to Benjamin to keep up the standard for traditional Peranakan dishes. In addition to her cooking skills, Daisy is also well known for her nyonya kueh and pastries like Kueh Ku, Onde Onde and Pineapple Tarts which has been acclaimed as one of the best in Singapore. Irene Ong specializes in Peranakan pastries. She bakes traditional crispy Pineapple Tarts, Kueh Bangkek, Sugee cake, Fruit cake (steamed and baked), traditional cookies such as Almond Horseshoe biscuits, Almond and Peanut cookies. 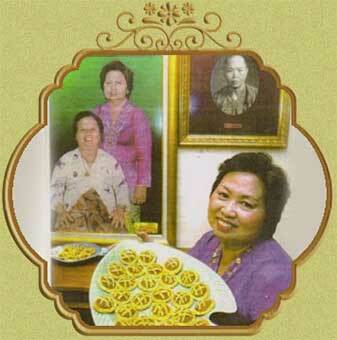 She takes after her mother who specialized in nyonya kueh. To date Irene still keeps the hand-written receipes handed down by her grand-aunt to her mother. What started as a hobby to her, baking is now ‘bread and butter' to her. Irene is also a part-time actress. She has acted for television and Peranakan Theatres, namely as ‘Siew Mui’ maid to the Matriach in ‘Ways of the Matriach;’ Series II, III and Happy Nyonya New Year. Her last major appearance was as Bertha or Gek Choo in Bertha’s nest on Channel News Asia.